Detailed REALISTIC SCARY, SPOOKY and GROSS... Fresh Decor from a Creepy Haunted House! 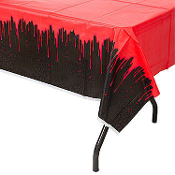 Spooky disposable plastic party tablecloth for haunted house, yard, dungeon, torture chamber, graveyard cemetery scene, mad doctor, scientist, laboratory backdrop scenery or party decor. Easy clean up! Halloween gothic red bloody center and black gothic pattern print border, with blood drip border surround.